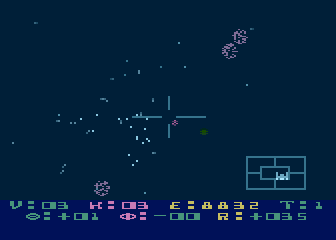 The classic game Star Raiders was written in 1979 by Doug Neubauer and became a killer app for the original Atari 400/800 computer system. It’s a seminal game. An issue that you notice playing it is that the framerate slows down considerably when an explosion occurs. This is because the explosions are rendered as a bunch of individual points expanding in the 3D coordinate space, and converting to the 2D screen representation requires lots of math. The 6502 has no built-in division operation, and in an interview with James Hague, Doug Neubauer stated that his signed division code was not optimal. So, that’s my starting point: see if I can replace the division algorithm with something faster. In an unexpected twist, an original paper copy of the Star Raiders source was discovered by Steve Hales, scanned by Kevin Savetz, and placed on the Internet Archive. STRRAM:                         ; RAM FOR STARS , OBJECTS POSITIONS, ETC. The Retrochallenge is over and I was not able to finish my project. However, I did make progress and have a clear idea of the solution, if no idea on how to actually implement it or where to put it in the code or how the code actually uses its current division algorithm. Stay tuned to this page for infrequent updates, and perhaps as my entry into the Retrochallenge 2016/01! The WUDSN IDE has source level debugging when using the MADS assembler, but unfortunately I’m not using the MADS assembler and haven’t investigated how hard it would be to convert the CC65 assembler format to MADS. Probably not insurmountingly hard, but I’m not taking that direction at this point because I hate Eclipse. Kinda stupid to hate tools, but it’s always been miserable to set up for me, and plus: Java. Altirra does have a nice graphical debugger and I finally started to understand (using VirtualBox – wine seems a bit flaky). Using F8 to break into the program, I set a breakpoint at $AC6B which is the assembled location of INIT_EXPLODE in the starraiders.lst output file. Then use F8 to restart and wait for an explosion. Interestingly (and frustratingly for debugging purposes!) I’ve found that if you fly the ship straight, the enemies do this oddball orbit around you, firing all the time, but the shots miss most of the time. Have no idea what these arrays are for, yet, but using the Memory window of Altirra I can see them changing. So stuff is happening at least. In addition to the speed penalty for laying things out in C standard order, there is also a size restriction resulting from this (naive) implementation: the total size can’t be larger than 255 + len(struct test) bytes because the x register can of course only contain a single byte. Of course bigger structures are possible but that involves more computations at each access. Ok. Progress. But, what sorts of values does each of those store? I’m going to bed. 4am I am not. 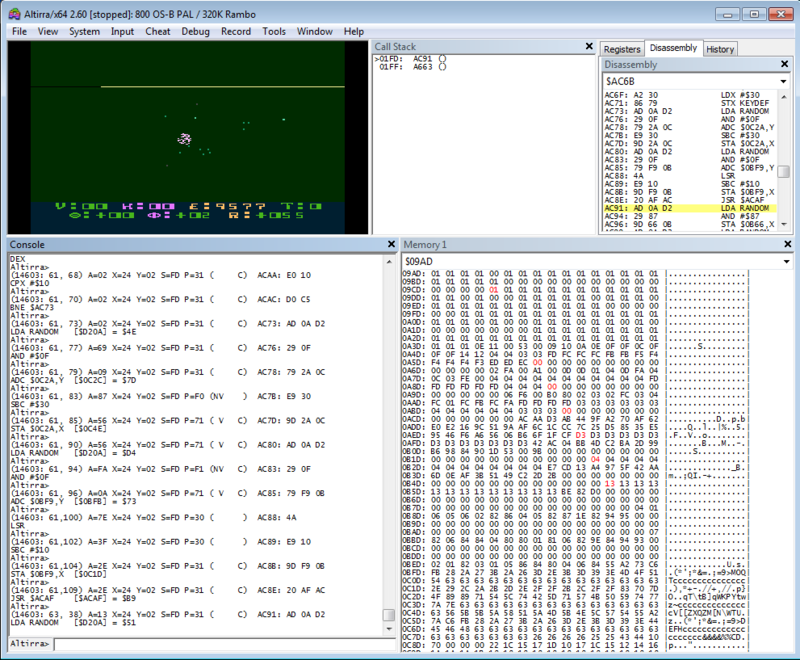 OK, so I’m struggling with the debuggers in both atari800 and Altirra and I’m having a hard time making progress with the Star Raiders because I have to wait for an explosion to set a breakpoint, which means a minute or two to fly around, find some Zylons and shoot one to generate an explosion. Lots of time for each iteration. I’m pretty close to abandoning the project for the time being (again). But, here at KansasFest I bought the book Assembly Lines from the editor of the book, Chris Torrence, and got to wondering how the division algorithm (below, from codebase64) might work. So here’s a dissection. As a refresher (and I had to look this up myself again), the divisor is what you’re dividing by. In fractional terms, the dividend is the numerator and the divisor is the denominator. so the final result of 0xdb6d/0x029c is 0x54 with a 0x3d remainder. I talked to Martin Haye, co-author of Lawless Legends and he suggested lookup tables using logarithms to speed up the division, which is one of those things that in hindsight should have been obvious. He said that for the cost of the log table and its inverse (the exponential function), he can get an approximate division result with only a couple of shifts and subtraction – stuff that the 6502 can do well. So, that’s my new approach: logs. I need to figure out how the variables are being passed into the current division algorithm and what the range of the results are, and then I can start generating log tables. I was reminded about the Retro Challenge while listening to the latest RCR Podcast and thought it would be a perfect way to motivate me to start looking at Star Raiders again. The Retro Challenge goes through the month of July, but I expect that I’ll be doing most of my work during KansasFest while other people are working on their Apple Hackfest projects. I’m going to walk you through my process as I try to figure things out. As an aside, if you want to read about someone who knows about reverse engineering, check out 4am on twitter who has some really technical but very entertaining writeups. SUB73 seems more likely candidate for arbitrary division because SUB65 isn’t a loop, it drops straight through. SUB89 (renamed to INIT_EXPLODE) seems to set initial params for explosion because these are the same data storage places referenced in SUB73 (and SUB65) for that matter. I set a break point at $AC6B and fired up Star Raiders, went to galactic chart, hyperspaced, started attacking soemthing, got a hit, and blam! The breakpoint was triggered. Seems like it might be right. AtariAge forum thread: Star Raiders - was it ever fixed?